Happy Rizal Day to everyone! Today is the 114th anniversary of the martyrdom of Dr. Jose Rizal. As we begin the year-long celebrations for the 150th birth anniversary of Rizal on June 19, 2011, the Heritage Conservation Society, Department of Tourism and Intramuros Administration will be launching the Rizal Heritage Trail to encourage people to revisit places Rizal visited in the Philippines, sites and structures with a connection to Rizal or significant monuments that honor him. • San Fernando Train Station (San Fernando, Pampanga) - Rizal exited this station on June 27 and 28, 1892 to visit friends in San Fernando and Bacolor as part of his mission to recruit members to his La Liga Filipina. Among the houses he visited were those of Tiburcio Hilario in San Fernando on June 27 and Ceferino Joven in Bacolor on June 28. An NHI marker was installed in the station in 2004. • Malolos Train Station (Malolos, Bulacan) - Rizal exited this station on June 27, 1892 to visit friends in Malolos as part of his mission to recruit members to his La Liga Filipina. • Bautista House (Malolos, Bulacan) - This is one of the houses Rizal is said to have visited when he was recruiting members for the La Liga Filipina on June 27, 1892. • Women of Malolos Marker (Malolos, Bulacan) - The site of the school of the Women of Malolos whom Rizal wrote to on February 22, 1899 from London. • Leonor Rivera House (Camiling, Tarlac) - Leonor Rivera is said to be inspiration for Maria Clara in Noli Mi Tangere. Rizal and Rivera were in a relationship for eleven years. But Rivera's mother was against the relationship and intercepted letters from Rizal. She was later convinced by her mother that Rizal no longer love her and reluctantly married Henry Kipping from England. 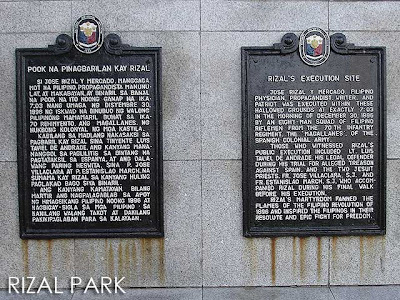 • Rizal Monument (Manila) - A National Monument, it houses the remains of Rizal. It was designed by Richard Kissling of Switzerland. 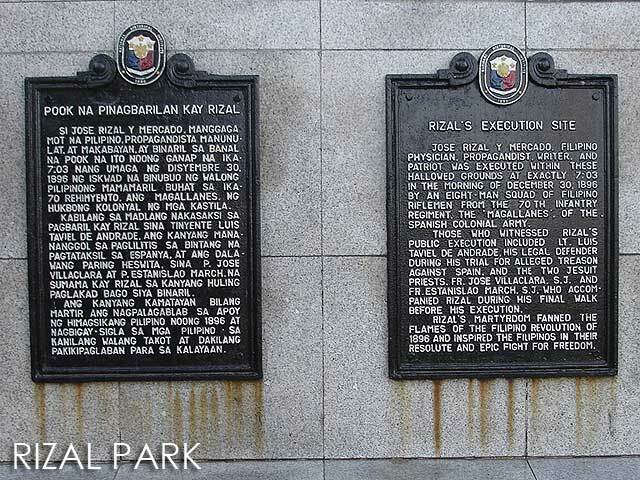 • Paco Park (Paco, Manila) - Rizal's remains were secretly interred in the Paco Cemetery. They were guarded for fifteen days by the Guardia Civil Veterana. His remains were exhumed on August 17, 1898, placed in an urn and deposited in the Rizal Residence in Estraude Street. • Rizal Residence (619 Estraude, Binondo, Manila) - The urn containing Rizal's bones were brought to this house until they were transferred to the Rizal Monument on December 30, 1912. Rizal's father Francisco Mercado died in the house on January 5, 1898. • Residence of Rizal's Family (525 Magdalena, Binondo, Manila) - Site of house owned by Concepcion Leyva where Francisco Mercado, Teodora Alonzo and several of their children and grandchildren lived. • Tuason House (C. Arellano Street, Malabon) - Rizal was a friend of Lorenzo Tuason, a free mason. According to oral tradition Rizal diagnosed and operated someone in the family. The very table where he had dinner is with an heir. Only the gate of the house is left. • Paez House (C. Arellano cor. Paez Streets, Malabon) - Among the people Rizal is said to have visited during his trip to Malabon was Lucino Paez. • Rizal Shrine (Calamba, Laguna) - A National Shrine, it is a replica of the Rizal House by Juan Nakpil. Restored by Executive Order No. 145 of President Elpidio Quirino, it was inaugurated on June 19, 1950. • Calamba Church (Calamba, Laguna) - A National Historical Landmark, Rizal was baptized in the church by Fr. Rufino Collantes on June 22, 1861. 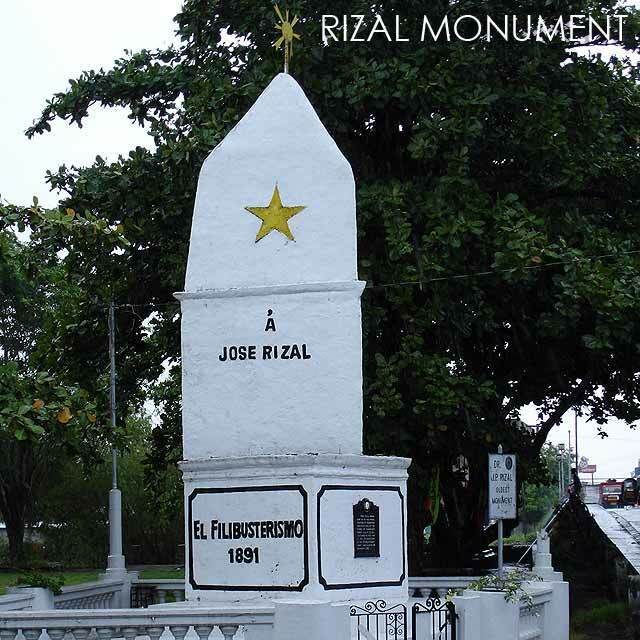 • Rizal in Binan Marker (Binan, Laguna) - Rizal received his first formal schooling under Justiniano Cruz who later advised him to further his studies in Manila. • Alberto House (Binan, Laguna) - The house of Rizal's grandfather Lorenzo Alberto y Alonzo, Rizal lived there from 1870 to 1871 while he was studying in Binan. Sadly, the house is currently being dismantled and will be transferred to Bagac, Bataan. Such an important heritage structure should remain in Binan, Laguna. • Casa Segunda (Lipa, Batangas) - A Heritage House, Casa Segunda is the residence of reputedly the first love of Rizal, Segunda Katigbak. • Rizal Monument (Daet, Camarines Norte) - This was the first monument honoring Rizal erected in the country. 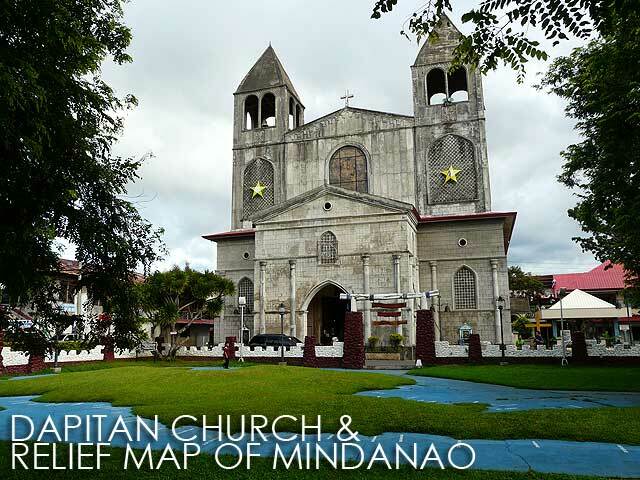 It was built by voluntary contributions of the people of Camarines Norte and unveiled on December 30, 1898. It is a National Historical Monument. • Rizal Shrine (Dapitan, Zamboanga del Norte) - Rizal's estate during his exile in Dapitan, it houses replicas of structures he built there for himself, his family, pupils and patients including the Casa Residencia, Family Kitchen, Casa Redonda, Casa Quadrada, Casitas de Salud and Casa Redonda Pequena among many others. 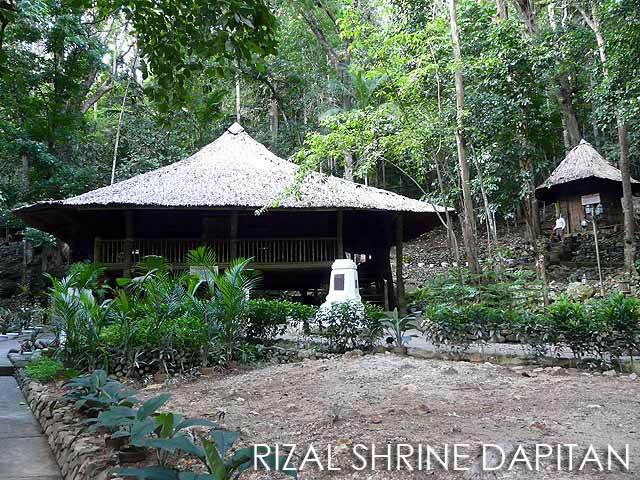 • Waterworks of Rizal (Dapitan, Zamboanga del Norte) - The waterworks Rizal built can still be found in the Rizal Shrine. • Dapitan Plaza (Dapitan, Zamboanga del Norte) - A National Historical Landmark, the Dapitan Plaza was planned and beautified by Rizal during his exile. Acacia trees which he personally planted can still be found in the plaza. • Site of the Casa Real (Dapitan, Zamboanga del Norte) - The official residence and administration building of the politico-military governor of the district, Rizal lived there from July 17, 1892 to March 1893 when he was transferred to Talisay, now the Rizal Dapitan Shrine. • Dapitan Church (Dapitan, Zamboanga del Norte) - Built in 1883, a historical marker can be found in the St. James Church of Dapitan in the exact spot where Rizal stood every Sunday during his exile from 1892 to 1896. • Relief Map of Mindanao (Dapitan, Zamboanga del Norte) - A National Cultural Treasure, Rizal created this map as an aid in teaching history and geography to the locals. • Santa Cruz Beach (Dapitan, Zamboanga del Norte) - On July 17, 1892, Rizal landed on Santa Cruz Beach at 7 p.m. with Captain Delgras and three artillery men. They walked through Sta. Cruz Street with a farol de combate to the Casa Real where he was presented to Don Ricardo Carnicero, the Spanish military governor of the area. A tableau was constructed in the site to commemorate Rizal's arrival in Dapitan. • Dipolog Cathedral (Dipolog, Zamboanga del Norte) - Rizal is said to have designed the church altars of the Dipolog Cathedral. Although the facade has been extremely renovated, the interior remains relatively intact. • Rizal Farm (Katipunan, Zamboanga del Norte) - The farm was acquired by Rizal from Calixto Carreon, a blind patient who offered it for free out of gratitude for his successful treatment. Rizal refused and paid him Php200 for the land. He cultivated it every weekend with his pupils. I'm sure there are more sites which I missed. So if you know of any, please leave a comment below so that we could include the site in this list. Rizal was most definitely a jet-setter! Among the cities he visited were Singapore (then a British colony), Colombo (Ceylon now Sri Lanka), Aden (Yemen), Naples, Turin, Milan, Venice, Florence and Rome (Italy), Marseilles, Paris, Dieppe, Vernon, Rouen and Biarritz (France), Barcelona and Madrid (Spain), Strasbourg (then part of Germany), Heidelberg, Wilhelmsfeld, Bonn, Koblenz, Cologne, Frankfurt, Leipzig, Dresden, Berlin, Munich, Stuttgart, Nuremberg and Ulm (Germany), Leitmeritz or Litomerice, Prague and Brunn or Brno (Bohemia now Czech Republic), Vienna and Salzburg (Austria), Basel, Lausanne and Geneva (Switzerland), Port Said, Suez Canal and Alexandria (Egypt), Saigon and Chelong (Vietnam), Hong Kong (then a British colony), Yokohama and Tokyo (Japan), San Francisco, Sacramento, Reno, Ogden, Denver, Farmington, Salt Lake City, Provo, cities in Colorado, Nebraska, Illinois, Chicago, Albany and New York (United States), Queenstown, Liverpool and London (United Kingdom), Brussels and Ghent (Belgium), and North Borneo. The first city outside the Philippines Rizal got to visit was Singapore. The first Eurpoean city he set foot on was Naples, Italy. I'm sure there are more cities that Rizal visited which he no longer mentioned in his letters. Note that he traveled to all these places in just a span of ten years from 1882 to 1892. Follow the 150th Birth Anniversary of Dr. Jose Rizal on Facebook and Twitter @Rizal150. And don't forget use the hashtag #Rizal150 when tweeting about Rizal. 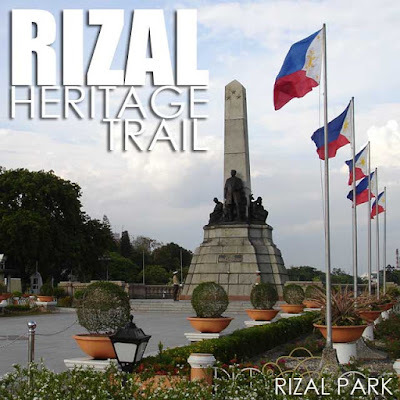 Blog about Rizal and share your posts on the Facebook page.